This very rare British Passport was issued by the UK Consulate in Hankou, China, as a Chinese version of the normal UK Passport to ensure local officials gave safe conduct to British visitors (mostly Missionaries). Hankou, close to the junction of the Yangtze and Han Rivers, was an important center for Missionary work in China. The Paper Passport is unique in that it was the only one issued in 1905 to the Rev. C. Carwardine, and is rare since only 65 such passports were issue in Hankou between January 1905 and mid-November 1905. 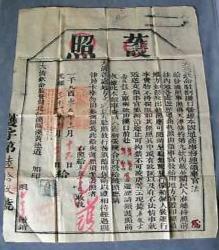 It has two consular postage stamps (2 & 5 shillings) that have been authenticated with the Hankou Consular rubber-stamp (and signed for the consulate by W. Hitchens).The large red Chinese ‘Chock Stamps’ are those of the British Embassy (in Chinese Script) authorizing the passport. This document is in good condition considering the age and the very flimsy paper it is printed on. There are just a couple of small insignificant tears in the paper. The document measures about 21 by 17.5 inches (54 x 44 cm.). Congratulation to the winner who paid 1044 USD. To add further interest to this document, I believe that its holder, the Reverend C. Carwardine was the elder brother of George Carwardine. George was the inventor of the Anglepoise lamp in 1932. Theo, you are absolutely right. The last 2 mentioned items I have seen now frequently placed. Some sellers are far away from realistic prices. Sometimes I do contact them and tell them in a nice way that their price is not realistic. The answer you get sometimes is everthing but polite.